Data from an ongoing survey by NASA's Swift satellite have helped astronomers solve a decades-long mystery about why a small percentage of black holes emit vast amounts of energy. Only about one percent of supermassive black holes exhibit this behavior. The new findings from a study by Koss, Mushotzky, and the SWIFT BAT team confirm that black holes "light up" when galaxies collide, and the data may offer insight into the future behavior of the black hole in our own Milky Way galaxy. The study appears in the June 20, 2010 issue of The Astrophysical Journal Letters. The intense emission from galaxy centers, or nuclei, arises near a supermassive black hole containing between a million and a billion times the sun's mass. Giving off as much as 10 billion times the sun's energy, some of these active galactic nuclei (AGN) are the most luminous objects in the universe. They include quasars and blazars. Theorists have shown that the violence in galaxy mergers can feed a galaxy's central black hole. 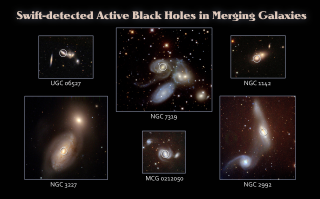 But observers have had difficulty finding active galaxies linked to mergers other than in the brightest quasars. Until Swift's hard X-ray survey, astronomers never could be sure they had counted the majority of the AGN. Thick clouds of dust and gas surround the black hole in an active galaxy, which can block ultraviolet, optical and low-energy, or soft X-ray, light. Infrared radiation from warm dust near the black hole can pass through the material, but it can be confused with emissions from the galaxy's star-forming regions. Hard X-rays can help scientists directly detect the energetic black hole. Since 2004, the Burst Alert Telescope (BAT) aboard Swift has been mapping the sky using hard X-rays. Building up its exposure year after year, the Swift BAT Hard X-ray Survey is the largest, most sensitive and complete census of the sky at these energies. The survey, which is sensitive to AGN as far as 650 million light-years away, uncovered dozens of previously unrecognized systems. Koss and Mushotzky and the SWIFT BAT survey team found that the Swift BAT survey is giving us a very different picture of AGN. The team finds that about a quarter of the BAT galaxies are in mergers or close pairs. Perhaps 60 percent of these galaxies will completely merge in the next billion years. This may be the 'smoking gun' for merger-triggered AGN that theorists have predicted. See also the Press Release at NASA.gov.